In a couple of weeks, the London 2012 Olympic Games will begin. I’m not particularly looking forward to the Olympics and am not a huge fan of the cynical marketing which has surrounded the Games and the Jubilee this year. A couple of months ago, my friend Biltawulf was wasting his life by looking at rubbish on the internet, when he discovered a special package deal on the Thomas Cook website; two tickets for the Olympic opening ceremony and a two night stay at the Athenaeum Hotel website for the bargain price of only £12,998. A normal two night stay at the same hotel, not including Olympic opening ceremony tickets, would be £737. Rather than simply checking to see if there were tables available at the restaurant that evening, Bilta decided to book a table for four. I assume he booked a table for four, because although Bilta and I are friends, we’re not really the sort of friends who would go to a fairly smart restaurant for dinner together. By booking a table for four, Bilta carefully avoided putting undue pressure on our friendship. But whilst he solved that problem, another problem presents itself; there are now two empty seats at our table. We need to fill those seats, and that is where YOU come in. YOU can apply to have dinner with Biltawulf and me. 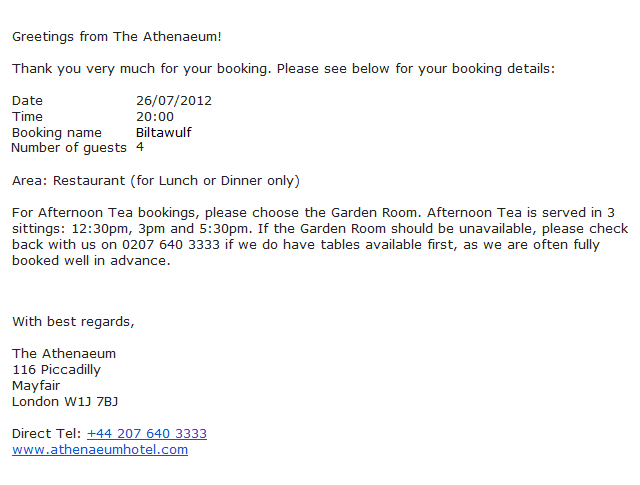 Please bear in mind that we are not offering to pay for you to have dinner with us, you will have to pay for yourself. We are also not offering to pay for your travel or any other costs you may incur. We are not offering you anything whatsoever. We just need to fill the two empty seats at our table so it looks like we have friends. If that sounds like something you are interested in, go HERE for more information and to apply online (deadline is 12noon on 21st July 2012).